Gov. 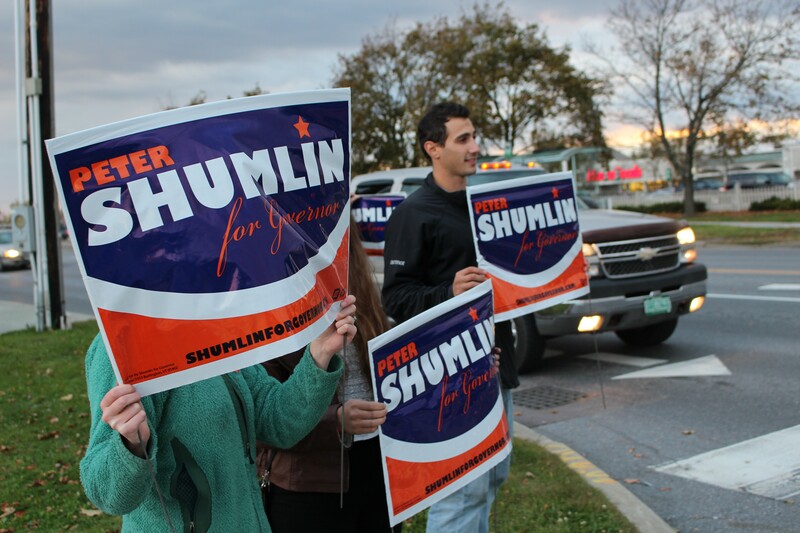 Peter Shumlin's supporters hold signs outside an October 2014 debate. When he announced Monday that he won't seek a fourth term, Gov. Peter Shumlin ignited one of the earliest gubernatorial contests Vermont has seen in years. Based on early indications of interest, it may also end up being one of the most crowded. Running a campaign for the state's top office ain't easy. Just ask KSE Partners lobbyist Alex MacLean, who managed Shumlin's first gubernatorial bid in 2010 and his reelect in 2012. "It's very similar to opening a business," she says. "You need to juggle eight balls at the same time. You're drinking from a firehose." So what should Vermont's maybe-kinda-sorta gubernatorial candidates keep in mind as they prepare to enter the race? 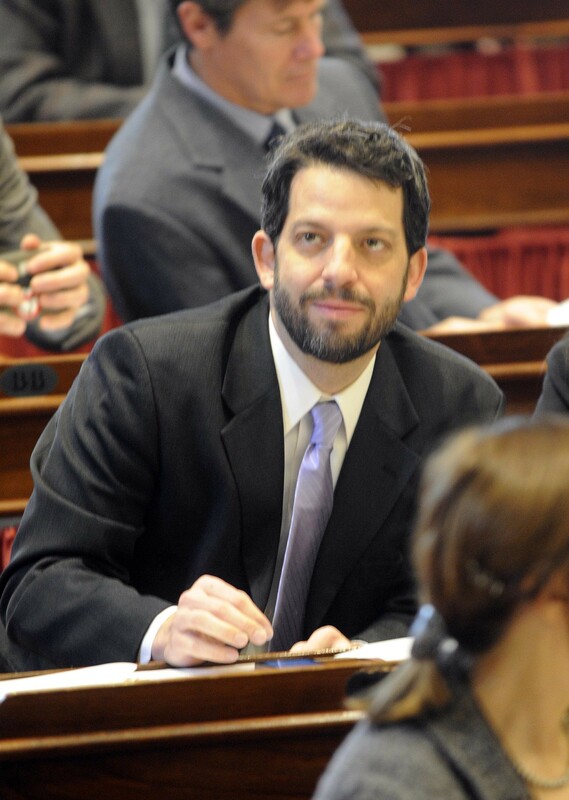 We asked MacLean and other alums of recent statewide campaigns. The general election may be 17 months away, but the work starts this week, the pros say. "Organize, organize, organize," advises Democrat Mike Pieciak, who ran Attorney General Bill Sorrell's 2012 reelection campaign and now serves as deputy commissioner at the Department of Financial Regulation. "Reach out to local supporters. Build a network of donors, both inside the state and outside the state." Republican Darcie Johnston, who managed former auditor and senator Randy Brock's 2012 gubernatorial campaign, says fundraising comes first. "Raise your first $100,000 to $150,000 immediately, and don't do another thing until you have that money in the bank," she says. Doing so, Johnston argues, "shows credibility" and ensures you can afford a campaign infrastructure. Potential candidates should make sure their families are on board before doing anything else, says Rep. Jill Krowinski (D-Burlington), who ran the Vermont Democratic Party and managed former House speaker Gaye Symington's 2008 gubernatorial campaign. "You need to set some sort of ground rules with the family of what it looks like and what their involvement may be," she says. Campaigning can be a part-time job until next spring, she says, but then it will quickly "ramp up" into a full-time job. When should candidates make clear they're running? Many Democrats are waiting to see whether Congressman Peter Welch (D-Vt.), widely considered the party's strongest candidate, enters the race. If he opts out, some of the pros advise that others should get in immediately. "There are so many different factors, but obviously I think the earlier the better," Krowinski says. Doing so makes it easier to line up supporters, donors and staff — and can scare off other potential candidates. "I think we're going to see it start up much sooner than some people anticipate," MacLean says. "I think it could start up this summer." Rep. Chris Pearson (P-Burlington), a communications consultant who worked for Sen. Bernie Sanders (I-Vt.) and helped run Dean Corren's 2014 lieutenant gubernatorial campaign, isn't so sure. "I think people aren't eager to have more and longer campaigns," he says. Those who currently hold office, such as House Speaker Shap Smith (D-Morristown), have an excuse to travel the state and meet with potential supporters without declaring their candidacy, Pearson notes. "There's an opportunity to begin campaigning without being in official campaign mode, and I'm sure you'll begin to see people do that," he says. To contest the last open gubernatorial seat, in 2010, Shumlin spent $1.4 million, while Republican Brian Dubie spent $1.5 million. Almost everyone Seven Days spoke with said candidates this time around should expect to raise and spend $1.5 million or more through the end of the general election. One pro who declined to be named said $2 million should be the target. Of course, that number depends on who you are and what you need. To contest a crowded primary, $500,000 may be sufficient. If Welch enters the race and scares off other Democrats, he could likely husband his resources until fall 2016. And, according to Johnston, Republicans will have to raise far more because they won't be able to rely on a robust party infrastructure, as the Dems will. "I think you could maybe scrape by on the Democratic side with a million dollars," she says. "I think on the Republican side it's going to take $1.5 to $1.8 million." Republican Dennise Casey, a public affairs consultant who worked on all four of former governor Jim Douglas' campaigns and managed his 2006 and 2008 bids, notes that buying television advertising time in a presidential campaign year will be expensive and difficult. With so many candidates on the ballot — in Vermont, New York and New Hampshire — some stations may simply run out of airtime. Early fundraising success will help separate the wheat from the chaff. "One of the ways you winnow down a contested primary field is by getting ahead on the money chase," Pearson says. "Part of what will happen at this phase is trying to box out others." That means getting on the phone right away. "I think you immediately need to start compiling a list of those that you know you can call and call them right away," MacLean says. "You need to comb through personal contacts, old colleagues, friends, college roommates — the low-hanging fruit." It certainly helps if you're loaded. In 2010, Shumlin personally loaned his campaign $275,000, which allowed him to run TV ads earlier than any other candidate. Vermonters won't be the only ones contributing to next year's gubernatorial race. If it appears competitive, the Democratic Governors Association and Republican Governors Association are sure to get involved, particularly because presidential campaign years feature fewer competitive gubernatorial races. Both Washington, D.C., organizations will likely play a role recruiting candidates they deem the strongest — perhaps Welch on the Democratic side and Lt. Gov. Phil Scott on the Republican side. And the DGA and RGA may spend big, as they did in 2010. Other organizations could also get involved. 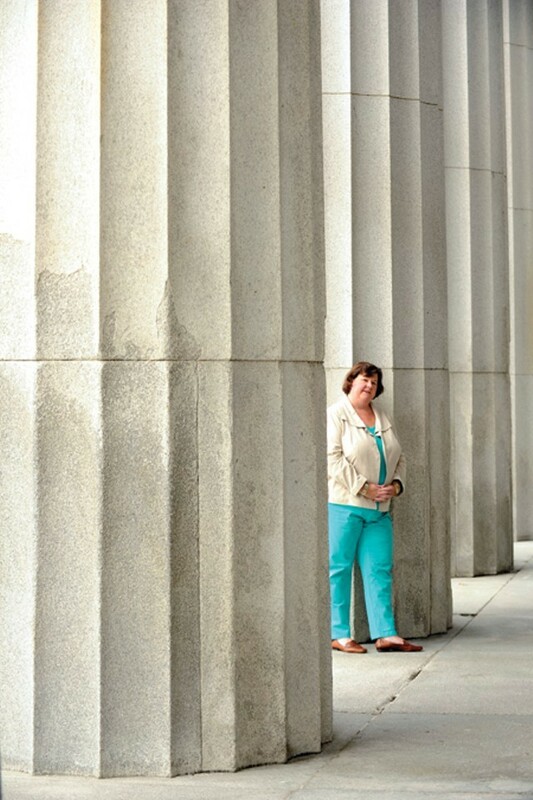 Though most of the candidates mentioned are men, EMILY's List could financially support a woman, such as Secretary of Transportation Sue Minter, should she choose to run. And even homegrown organizations could play big. If he doesn't run for governor himself, retired Wall Street banker Bruce Lisman could set up a super PAC and bankroll a candidate of his choosing — as could Vermonters First founder Lenore Broughton, a conservative heiress from Burlington. When should candidates hire a campaign manager and other staffers? "In the early days, they should be able to do it with volunteers and a couple key people," Johnston says. "Twelve to 15 months to run a campaign is gonna take a very small infrastructure that can gear up as you get into May of next year." It's a balance, says Pieciak, because you don't want to start paying a campaign manager immediately, but "you don't want to let resources get away." Vermont has a small pool of campaign hands and, according to MacLean, outsiders don't always get it. "I do think it's ideal to have someone from in-state," she says. "I think they do have a sense of when a candidate is being genuine, and I think when you bring in an out-of-state campaign manager, they can miss many of those nuances that make Vermont unique." Most important, the pros agree, is for potential candidates to get out of the office and start talking to key influencers — and voters. "I think Vermont is a state that doesn't just value retail politics, we require retail politics," Casey says. She points to Shumlin and her old boss, Douglas, as particularly good at pressing the flesh. "They got around and were approachable and accessible. That's something that's very important," she says. "There are other folks who will be in the field who have not taken the opportunity to get out there and spend time with Vermonters, so it's going to be tricky for them to make up that ground." Candidates are likely already courting the state's traditional power brokers, such as Lake Champlain Regional Chamber of Commerce president Tom Torti, Green Mountain Power CEO Mary Powell, St. Albans Messenger publisher Emerson Lynn and, of course, the "Burlington Bishops." But Krowinski says candidates should, "Try to get out of the typical group." "I think it's really important to reach out to the next generation of leaders and include them in these preliminary conversations," she says.